Have you been bombarded with emails and commercials about deals and found yourself wondering if you need another wireless speaker because it is 70% off? As we head into the craze of the holidays - the gifting, the hemorrhaging of money, the overdoing and overeating of everything - we have decided to hit pause and try not to cave to all of the pressure this season. This will be our second Christmas without our dear sister Colleen and it is not something that gets easier. Last year, we left town and avoided much of the holiday chaos, focusing on being together as a family. We have yet to figure out our “new Christmas normal” without Colleen. Our holiday cheer is a little different now, it comes with some tears and fewer gifts. Our tears arrive at different times and for different reasons. Maybe it’s that we don’t have the great gift ideas that Colleen always had. Maybe it’s that we feel disorganized without her. Maybe it’s that she always picked out a special present for her godchild, but we won’t have the joy of seeing it this year. Maybe it’s when we are pulling together recent family pictures for a gift and she’s not in them. Maybe it’s worrying that they will play the Christmas hymn “Go Tell It on the Mountain” at church and we will lose it because Colleen always jokingly belted that one out. After you have seen your sister get through her “last Christmas”, all of the stuff that we buy and receive just doesn’t seem to matter. Many find it difficult to navigate the holidays after a loved one has died. As we learned from this recent article, there is no “right way” to survive the holidays. As suggested, time and being honest about your feelings can help. There is an underlying grief that recurs with the holidays and it is exhausting to pretend to be full of holiday cheer. We no longer feel the need to bake 10 kinds of cookies, but we still struggle with the outside pressure to have a perfectly decorated house and the appropriate amount of presents. Don’t get us wrong, we do like gifting and still call our Mom “Santa,” but we are doing less of it all - less baking, less gifting, less wrapping, less cooking. Instead, we want to spend time putting together thoughtful gift ideas and writing down memories. We are hopeful that we can commit to this trend and that it will reduce stress and allow time to acknowledge our grief. Our happiness comes from our loved ones, not all of the things, and we want to remember that each year. 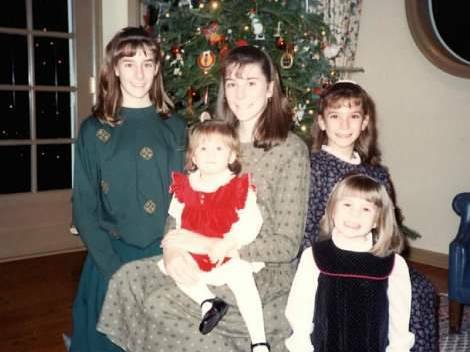 In many ways, losing our sister helped us find more meaning in family and appreciating life - and isn’t that a big part of the holiday spirit? So for that, we are grateful. Although we wish we hadn’t gone through all of this pain to get here, it has helped us realize what is important to us: keeping things simple so that we can enjoy the holiday season and enjoy each other.